Barye challenged tradition when he submitted his savage animal sculptures to the Paris Salon in the 1830s. At the time, the human figure was considered the noblest subject for high art, while animals—particularly violent animals—ranked at the bottom. Despite the lowly status of animals in the artistic hierarchy, Barye's predatory tiger received a Salon medal in 1831. Commissions for both tabletop and monumental animal works followed. In the end, the sculptor would become renowned as an animalier, or animal artist. Tiger Surprising an Antelope is one of Barye's series of predatory tiger sculptures, inspired perhaps by the arrival of the first live Bengal tiger in Paris in 1831. Barye, along with romantic painter Eugène Delacroix, visited the Jardin des Plantes to observe and sketch the tiger, as well as deer and gazelle. Barye used these sketches from life (he also studied animal dissections and, possibly, stuffed specimens) to conceive his naturalistic works. 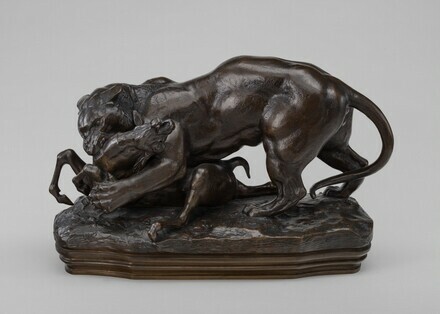 Although hunting subjects had been favored for ornamental sculpture in the eighteenth century (as in the Gallery's gilt rococo firedogs) Barye's Tiger Surprising an Antelope reflects the romantic notion of the terrible sublime: in the natural world, brute force overwhelms agility, delicacy, beauty. Here, with its slender back legs splayed and front legs pinned, the antelope strains, bawling, as the tiger punctures its throat. Barye first modeled Tiger in wax to achieve the dynamic contours and lines. The finished surfaces display Barye's virtuosity: the reflective vibrancy of polished bronze highlights the subtle stripes and tooled textures of the animal's fur. Eugene [1875-1959] and Agnes Ernst Meyer [1887-1970], Mount Kisco, New York, and Washington, D.C., probably after 1910; gift 1967 to NGA. The Eugene and Agnes Ernst Meyer Papers at the Library of Congress have no information as to when they acquired the sculpture, or its earlier provenance. It was probably acquired after their marriage in 1910. Nineteenth-Century Sculpture, National Gallery of Art, Washington, D.C., 1974, unnumbered checklist, as Tiger Seizing a Gazelle. Sculpture: An Illustrated Catalogue. National Gallery of Art, Washington, 1994: 26, repro. Butler, Ruth, and Suzanne Glover Lindsay, with Alison Luchs, Douglas Lewis, Cynthia J. Mills, and Jeffrey Weidman. European Sculpture of the Nineteenth Century. The Collections of the National Gallery of Art Systematic Catalogue. Washington, D.C., 2000: 14-18, color repro.